Bye bye, V8 juice! This healthy, homemade V4 version will blow you away. Would you rather have your refreshing summer vegetables raw? Check out my quick and easy gazpacho recipe. Is your garden full of green tomatoes that won't have time to ripen? Turn them into my super simple, super popular salsa-like green tomato relish. Or learn how to ripen green tomatoes indoors the really easy way. I have a sheep farmer friend who recently told me that she swears by Campbell's V8 juice when working out in the heat. She says it's more rejuvenating than drinking water or Gatorade and literally makes the difference between wanting to keel over and being able to keep going for hours. This is the kind of stuff I need to know—especially during haying season. But Campbell's V8 juice is mostly made from water and tomato paste, plus a frightening amount of salt. (Since you lose so much sodium while sweating, this may be part of the reason for its revitalizing abilities.) So what would be better than V8? Homemade V8! Technically my version is only V4, but you can add more vegetables if you like. 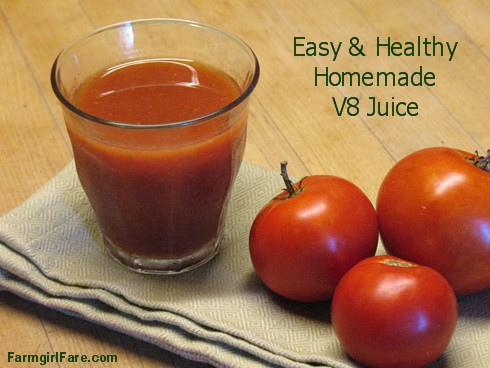 Either way, this healthy, easy to make vegetable tomato juice will blow that V8 away. To make it, all you do is chop everything up and toss it into a pot, simmer until soupy, then put it through a food mill (I have this one and love it). It's a great way to use up overripe, imperfect, or just plain ugly tomatoes, which you can sometimes find for a deal at farmers' markets. The first time I made it I used a bunch of tomatoes from my kitchen garden that had all cracked after a recent rainstorm and needed to be dealt with immediately. As I started putting the cooked mixture through my food mill, it seemed like an awful lot of it was being left behind, so I whizzed it up in the blender first and then put it back through the food mill. The two cups of leftover pulp were happily gobbled up by our always ravenous chickens. The unblended version is smooth and delicate and, if possible, tastes more like fresh tomatoes than fresh tomatoes actually do. It would be the perfect thing to serve at a Sunday brunch. The blended version is thicker and richer and has more celery and parsley flavor. It's also better for you since you're drinking more of the vegetable goodness. Both versions are refreshing and delicious—and miles above anything you'll find at the store. You can halve this recipe, but after the first sip you'll probably be sorry you did. As always, I urge you to seek out local and organic ingredients; they really do make a difference. Want to preserve your homemade juice in glass jars? See the canning instructions at the end of the recipe. This juice makes great Bloody or Virgin Marys, too. I doubled Elise's version on Simply Recipes and then applied my More, More, More philosophy, which included upping the onions and tossing in some fresh parsley. You can also add even more vegetable goodness. Campbell's V8 juice also contains beet juice concentrate, along with celery, carrot, lettuce, parsley, watercress, and spinach juice concentrates. Since I can't bear to eat my beets any other way than caramelized with garlic I'm thinking about tossing in some carrots or Swiss chard (which is so easy to grow, even in containers!) or perhaps even some sweet red peppers. If I'm going to be drinking this while picking up hay or otherwise sweating profusely, I double the amount of salt. Put all the ingredients in a large stainless steel pot. Bring them to a simmer and cook, uncovered, until very soupy, about 40 minutes. If a thicker juice is desired, first carefully blend the vegetable mixture in batches in a counter top blender, then put it through a food mill. For a smoother and more delicate juice, go straight to the food mill. A sieve might work but it would probably take forever. Next time I'll try using my hand blender instead of the counter top blender. Update: The hand blender worked really well. Chill for at least several hours before adding more salt or other seasonings. This juice will keep for at least a week in the fridge. I tried freezing some in a small plastic freezer container, but haven't defrosted it yet. I'll let you know how it comes out when I do. Update: When I defrosted the frozen tomato juice it had separated some, so that you could see teeny bits of tomato. It tasted okay but looked a little odd. I put it in the blender, and that made it all bubbly and sort of orange, though after sitting in the fridge for a while it settled down. For long term storage, this juice would probably fare better if canned in glass jars using the instructions below. If you use the frozen juice in a recipe, I'm sure it would work fine. To preserve your juice in glass jars: Heat juice 5 minutes at 190°F (I love my digital kitchen thermometer). Do not boil. Add 2 Tablespoons lemon juice or 1/2 teaspoon citric acid to each quart jar. Add 1 Tablespoon lemon juice or 1/4 teaspoon citric acid to each pint jar. Ladle hot juice into hot jars, leaving 1/4-inch head space. Adjust two-piece caps. Process pints 40 minutes and quarts 45 minutes in a water-bath canner. © FarmgirlFare.com, the juicy foodie farm blog where Farmgirl Susan shares recipes, stories, and photos from her crazy country life on 240 remote Missouri acres—and there can never be too many tomatoes. Sounds and looks delicious! No tomato crop here to work with but might try this next year with my normal high yield of "less than perfect" tomatoes. I'd try with the beets in it too - would give it a real zing I'd think. I cannot believe I never thought to make (and can!) tomato juice! Thank you so much for the recipe and the inspiration! My garden tomatoes are almost gone, so this recipe must wait until next season. I bet the hand held immersion blender would work great for this recipe. I love mine too! I have a Foley food mill that I got at a sale. It's 50 years old and looks like the day it was made. It works like a charm. I don't think you made any mistakes getting one. I have never wanted a different size disk. well thanks for sharing this recipe. I have made a combination drink. I made salsa that was too runny, so sieved out some of the juice and added it (no pulp) to tomato juice I had just made (lots of pulp). I call it "taco juice" and Norm loves it. It's 2 parts T juice and 1 part S juice. Great idea and thanks for the inspiration! 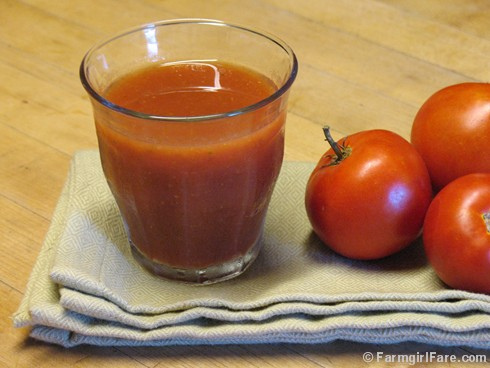 Farmgirl, I love you and everything about your blog, but really --- you can't include a recipe for tomato juice without at least an addendum for a Farmgirl Bloody Mary using said organic juice! This is rather a sort of green-eyed monster torture for me. I love tomato juice (& the Bloody Mary too!) but we do not have enough sun here to plant our own. And there'd be a major leak in the bank if we buy 6 lbs of Spanish plum tomatoes! What a great way to use that glut of tomatoes! I've done salsa but never juice! I've been away from the computer for a couple of weeks, so I had to catch up on your daily doses of cute. There's a lot of cute in your life! Thanks for sharing it with me. Cold weather is about to hit Indiana. I stripped my tomato plants yesterday. Your tomato juice looks great, but I think my tomatoes are destined to become ketchup. I've got a hankerin' for fried potatoes with onions, so I'll need me some ketchup! I'm a little panicky that my garden season is ending. I've had a really healthy summer of living off the land. Thankfully, I have a boatload of homemade pickles to get me through the winter. This looks really good and reminds me of all the time my mother spent canning tomato juice when I was a girl. Homemade tomato juice IS miles above the store versions, both in taste and healthiness; but be aware that your waste not want not version may thicken when canned. My mom's always did, and resulted in many a confused child trying to acertain between the juice and sauce when sent to the cellar. It's thick texture is also why it too a good decade and a half of adulthood before I'd try the stuff again! fabulous! i made some juice this year too, i wish that i had made more. great way to use up all those red ripe ones. Love your blogs! Keep them coming! V-8 concoction. It was awesome! to use more of the tomatoes. Making the juice, could I just push all veggies i'm using through my juicer ? I don't have much experience with juicers, but I'm thinking it would work fine to use one with this recipe - and you may end up with even more vegetable goodness in the finished product. If you do try it, I hope you'll come back and let us know how it turns out. I never thought to freeze the juice. Genius! I use V8 as a base for vegetable soup in the crock pot. Will try this recipe instead, for a TOTALLY homemade dish. I wonder why you cook the ingredients? I guess I assumed raw would be as good or better. Thanks! Would I be able to put all the veggies through my juicer first, then cook? I've been making tomato juice for years. At the end of the season I cook down almost anything that's left in the garden: cabbage, onion, peppers (whatever color plus some hot varieties), green beans, celery, carrots and tomatoes. Let everything simmer for awhile and then run through a food mill. I pressure can it since it has a lot of low acid veggies. It's great for soup, chili and the best Bloody Mary's in the world. This is the recipe I've used before with very good results. 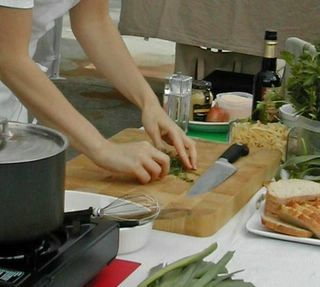 Like you, I want to add a few more ingredients and see what that tastes like. In a large dutch oven, combine the tomatoes, celery, and onion (and beet, carrot if using). Bring to a boil. Reduce heat and simmer uncovered for 45 minutes or until tender, stirring occasionally. Add greens, if using. Cool slightly. If you want just the juice, put the tomato mixture through a sieve or food mill. If you don’t mind it thicker, run the mixture through a blender or food processor. Return to the pan. Stir in the remaining ingredients. Bring to a boil. Remove from the heat and cool. Transfer to a pitcher; cover and refrigerate until chilled. I've also seen a recipe that added some green pepper. Would also like to try it with canned whole tomatoes to see if it tastes as good. Now - I have to get your new food mill! Mine is like your former one and I didn't think that it really worked all that well. Regarding your comment about doubling the amount of salt when sweating a lot, are you sure you need to do this? I ask this because the average diet in America gets well over the daily recommended amount. Unless you are already on a low sodium diet, you're probably getting plenty. The recommended daily upper limit for adults is 2300 mg. That being said, I feel that if a dish (Or drink, in this case) tastes like it needs more salt, then add it. I probably get over 4000 mg of salt per day, so I obviously don't follow my own advice. I just brought this up because it sounded like you thought you NEEDED to add more salt to keep up with your body's demand. I remember many years ago the Boy Scout official backpacking checklist included salt tablets. Yeah, like the canned chili and freeze dried foods weren't already loaded with salt. What were they thinking? This we'll definitely try. Haven't had either honey or cumin in ours, so that'll be an interesting test. I guess that kind of sweetening aren't that common here, we usually just use tomatoes, vinegar, garlic, salt and some strong sause like tabasco. Do you suppose you could cook it then put it through a fruit/veg strainer attachment for a KitchenAid? I made bloody mix last year and a almost have to chew it. Tried blending in my Ninja, but got the weird frothy orange stuff you mentioned. I'd rather not get another piece of equipment if I can use something I already have! The longer you cook it, the more it will resemble the canned version of V-8. I use a VitaMix for mine and it comes out smoother than any hand blender could ever do. If you're worried about the cooking having an affect on the vitamins or enzymes in the other vegetables, you could try giving the tomatoes a head start on the stove and adding the others later. It will take longer, but when the tomatoes get cooked down they release more pectin into the juice. that's most of what V-8 in the can is. I've been making something I call V4 for years now. I use 4 parts tomato to 2 parts carrots to 1 part each onion and celery. I cook the tomatoes separately so I can sieve out the seeds. Then using the liquid given off by the tomatoes, I cook up the carrots, celery and onions. I puree everything together, in batches, in my counter top blender. I do not run in through the food mill to preserve the healthy fiber provided by the whole vegetables. Once pureed, the mixture has the consistency of tomato sauce. I use it as the base of pasta sauces. I use 4 parts V4 to 1 part water to make tomato soup. I change up the seasonings to suit my mood. (My favorite is with a dash or three of oregano and have with a grilled cheese for lunch 4 or 5 days a month.) I mix it in 1 to 1 with water for a vegetable juice. Family members who like bloody Marys tell me this is there favorite mix for that beverage. :) Because this is a whole vegetable puree, it freezes very well without separating. I usually make it a gallon at a time and freeze 6 pints and keep a quart out to use right away. I enjoy this so much I find myself making a batch every 5 or 6 weeks. I do not add salt to it in the prep process because I am very sensative to sodium and what my body will tolerate varies from week to week (sometimes even day to day). Honestly though, this has so much flavor that I have served it as soup seasoned with nothing but a bit of oregano or basil and a healthy shake of Mrs Dash table blend, and my salt loving mother and nieces haven't even noticed that this was a salt free soup. Friday Daily Dose of Cute: Baby Love?